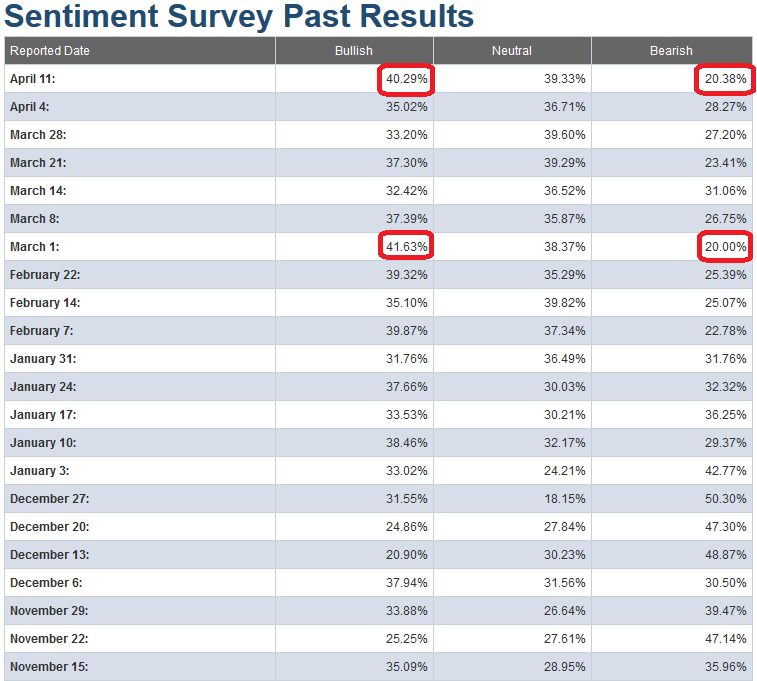 AAII Sentiment Survey results are out for this week. After four weeks of grinding sideways in “No Man’s Land” Bullishness is now up OVER the 40 level – which usually marks market reversals. Bearishness has collapsed. In the S&P500 chart above I have noted those dates in the recent past where Sentiment was at similar levels (Bullishness ~40, Bearishness <30). You can follow along with the red circles on the sentiment results below. Just because these readings correlated with pullbacks in the recent past does not mean they will do so this time. It does however mean we should be paying attention. It is possible we can burn through these elevated readings and go higher, but the odds don’t favor it. As with all indicators, they are to be used as barometers, not crystal balls.